NEC Corporation announced the sale of their new Express 5800 Scalable HA Server which is equiped with 6-Core Xeon Processor, Intel(R) Xeon(R) 7400-series. * Features state-of-the-art multi-core “Intel(R) Xeon(R) 7400-series” processors, with as many as 6-cores per processor. High-speed inter-box interconnect, “HSI” (High Speed Interconnect), technology enables seamless expansion of 4U boxes to multiple boxes, supporting up to 96-cores/16 processors. * Each box is equipped with 32 base memory slots. The maximum configuration supports 128 memory slots that may accommodate a maximum of 1TB of memory. * Each box is fitted with 6 hot-pluggable PCI-Express (x8) slots supporting up to 24 external interfaces in the maximum 4 box configuration. 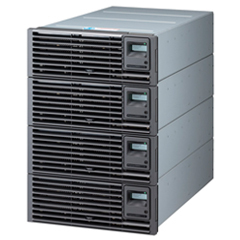 * Features mainframe-class reliability and availability through duplicating major components such as memory, HDD, and power modules. Also supports multi-bit error detection/re-transmission functions for high-speed interfaces that minimize system crashes and the impact of such failures. * Provides advanced fault-tolerance and remote monitoring functions with the EXPRESSSCOPE(R) Engine SP. * Designed to minimize system down time during scheduled maintenance by allowing part replacement from the front or back of the rack without using tools, and supporting online replacement of memory, HDDs, power modules and I/O cards. * Supports Windows Server(R) 2008 and Windows Server 2003, providing an optimal platform for large-scale Windows-based ERP applications such as SAP solutions. * Provides an optimal platform for large-scale databases that require high speed processing power, such as Oracle and SQL Server(R) 2008. * Supports VMware(R) ESX 3.5, Microsoft(R) Hyper-V(TM) on Windows Server 2008 and Citrix XenServer. * Supports separate use of virtualization in multiple partitions through the hardware partition function of the “Express5800/A11160” module. * Flexible operation management with NEC’s SigmaSystemCenter, which provides automatic migration and a system environment. * NEC provides “Linux Service Set MC” as the high availability Linux platform for the new product. The new product also supports Red Hat Enterprise Linux and newly developed middleware products, which enhances the platform availability. Such features enable rapid root cause detection and workarounds. The platform provides an optimal server environment for Linux for mission-critical system customers such as telecom, banking, and government offices that are currently using UNIX or mainframe systems.